It is that time of year. Time to add Christmas parties to the schedule. Time to get the gift shopping done. And for me, time to create the yearly Boy Scout Troop 68 dvd’s for each member of the troop. I began this tradition in 2004, the year I switched to digital photography. I bought a digital still camera early that year to take along on the troop’s trip to Philmont Scout Ranch that summer. I never looked back at film. The new camera allowed me take take hundreds of pictures during the year, several times more than I would have taken with film. By the end of the year I had quite a collection of digital photos taken during troop meetings, courts of honor, and troop activities. Instead of keeping them to myself, I decided to copy them to compact discs and give a set to each Scouting family. The parents would be able to see what their boys had been up to during the year, and they could print any pictures they would like to add to their photo albums. I also took the photos and used them to create slideshows of each troop activity, along with music. Using iDVD, I create discs of these slideshows and gave each Boy Scout one for Christmas. They became quite popular with the families. They were also fun to watch with the Scouts during the annual Christmas party. I have completed creating the dvd+r’s of this year’s photographs. I have also created this year’s slideshows. (Is slideshow even the correct term in this day and age?) This weekend’s project is to create the slideshow dvd’s and cases. If I have enough time I may make a second disc featuring this year’s courts of honor and/or other events. The year’s slideshow dvd will include nine videos totally about 50 minutes of memories. The picture dvd+r’s will contain about 3 GB of photos. The boys sometimes get annoyed with me during the year when I am taking the pictures but everyone like viewing them at the end of the year. The parents really like seeing them. I only have about a week to finish this project. The troop’s Christmas party in Saturday evening, December 13th. It will be fun to watch the Scout’s reactions to this year’s videos and see if they approve of the music I used. Does your troop do anything like this? What do think of this idea? Dakota received his Eagle Scout Rank on Saturday, April 2, 2011. That means it was time to make another Eagle Scout slideshow. This is the twelfth time I have created a video for an Eagle court of honor. Ten of those were for Boy Scouts from Troop 68. Two were for Scouts of other troops. I have also been working on creating slideshows for the earlier Eagle Scouts of Melrose Troop 68. Dakota and I sat down for the first time to plan the slideshow nearly a month ago. He is the first Scout who joined the troop after I switched to digital photography, so I have a lot of photos of him through the seven years he has been a member of the troop. Usually, I only had 200-300 photos of a Scout to sort through. I had over 900 pictures of Dakota. The two of us looked through them and began eliminating pictures. Dakota finally got it down to about 90 pictures. He choose three songs to play within the show, and surprised me with his choices. The finished video came to around ten minutes. The guests of the court of honor enjoyed the show. It included some serious pictures along with a few comical ones. The slideshow opened with a picture of a rabbit which has special meaning for Dakota. He explained the rabbit during his speech at the court of honor. Cub Scout Pack 68 of Melrose will be holding its Blue and Gold Banquet later this month. To provide a little entertainment during the evening I have volunteered to produce a slideshow of the pictures I have taken when I attended their den meetings and the Pinewood Derby. This slideshow is being sneak previewed for the Melrose Scout Productions Podcast. How many of you have done something like this for your Pack meetings or Blue and Gold Banquets? How did your audience and the Cub Scouts like it? 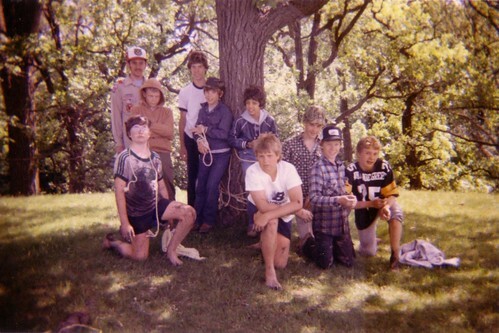 It has been awhile since I have placed a slideshow of Troop 68 on the blog, so let’s go back to 1983 for a look at what the troop was up to nearly thirty years ago. (Sometimes, I find it hard to believe I have been a leader of the troop for that long.) There are 111 photographs in this set. The Eagle Scout theme continues with Around The Scouting Campfire #15. The show begins with Buttons, the radical Boy Scout, looking through the Troop 68 photo albums. This leads to Scoutmaster Steve explaining his methods of creating a slideshow to be shown at an Eagle Scout’s court of honor. Michael, an Boy Scout from Troop 68, shares his thoughts and a story or two about how he became an Eagle Scout. Buttons shares some facts about Eagle Scouts, along with a few jokes. Then it is time for a scoutmaster conference about a Scout being cheerful. Download episode #15 by clicking HERE.